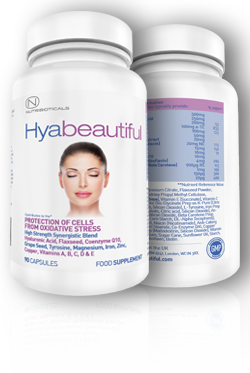 Purchase Hyabeautiful right now online with confidence via our secure store. Fast delivery worldwide. Vitamin C is an intrinsic part of the human body’s production of collagen 9,10 and a powerful antioxidant that can assist in rejuvenation of aged and sun damaged skin. 11,12 Levels of vitamin C decline with age.13 Unfortunately, humans lack the ability to create Vitamin C within the body and must obtain it through diet. With many modern diets and food processing techniques, Vitamin C is destroyed and not available to keep skin looking beautiful. It is also water-soluble and gets excreted very quickly and must be ingested frequently, on a daily basis, for optimum health, collagen formation and reducing the appearance of fine lines on the skin. Tyrosine helps produce melanin, the pigment responsible for hair and skin color. One of its primary functions is to protect the skin from sun damage and dissipate most of the UV radiation as heat. Skin cells use tyrosine to form melanin, the pigment that protects against the skin from the damaging effects of ultraviolet light. Thyroid hormones, which play many important roles throughout the body, also contain tyrosine as part of their structure. In fact, tyrosine is used to produce the hormone thyroxin, which is important in the regulation of growth and metabolism, and is required for healthy skin and the maintenance of mental health. The health benefits of niacin include maintaining good blood circulation, healthy robust skin condition, and normal functioning of the brain, boosting memory power, aiding the digestive tract to absorb sufficient carbohydrates, proteins, and fats. Iron is one of the more essential minerals for your body, particularly, if you are looking for healthier, smoother, and glowing skin. Iron is required by your body to make hemoglobin. Hemoglobin is a molecule in your blood that helps carry oxygen rich red blood cells from your lungs to all parts of your body (including your skin cells and facial muscles). When your skin is properly supplied with oxygen rich blood, your skin will look more radiant and rosy. Iron is useful element for proper functioning of antioxidants and also helps to activate vitamins in the B group. This also maintains the skin’s health. A deficiency of this vitamin can also causes fatigue, pale face, dry skin and split hair ends. Iron works in synergy with Vitamin C to help increase iron absorption rates. Coffee and tea can affect your body’s ability to absorb iron, because of the presence of polyphenols, so be sure to limit your daily intake. Iron is essential for younger, wrinkle-free skin. B complex vitamins are necessary for healthy skin, hair, eyes, and liver. They also help the nervous system function properly. Riboflavin works as an antioxidant by fighting damaging particles in the body known as free radicals. Free radicals can damage cells and DNA, and may contribute to the ageing process, as well as the development of a number of health conditions, such as heart disease and cancer. Antioxidants such as riboflavin can fight free radicals and may reduce or help prevent some of the damage they cause. Copper has numerous health benefits and works in synergy with fatty acids, amino acids and vitamins for regular metabolic processes. Copper deficiency is common as it cannot be produced within the human body and must be obtain by the diet, in foods such as; buckwheat, cashews, pumpkin seeds, walnuts, quinoa, sweet potatoes, mango, raisins and others. Copper is present in two forms, copper gluconate and copper sulphate. Found in almost every cell in the human body, the trace element assists in the production of melanin, which is responsible for the pigmentation of skin, hair and eyes. It also helps the body absorb iron. Often referred to as the ‘beauty vitamin’, it is very important for metabolic function, which translates to healthy skin, hair and nails. It is essential for the breakdown of fatty acids, which translates to healthy skin by creating a gloss on the skin to protect against water loss and damage from harmful sun rays. Your skin can manufacture plenty of vitamin D from around 20 minutes of summer sun exposure. It is the only vitamin that can be made by the body without it coming from the diet. However, it’s possible to not get enough vitamin deepening on your sun exposure time, age, geographic location etc. The sun can also damage skin, creating wrinkles and fine lines. Vitamin D is instrumental in helping epidermis form a watertight barrier that locks in moisture soft and supple. Without enough vitamin D your skin can sag from lack of adequate support. Dryness and wrinkles can appear as moisture is lost. 19 This is one of the primary reason vitamin D is crucial to the maintenance of healthily looking skin. Water should be taken in large quantities, from six to eight glasses a day. It gives the skin the necessary moisture and a dewy look. Water clears the system of all toxins and keeps the blood free from impurities. Water also protects the skin against pimples. In case of insufficient intake of water, the body will draw on all its water reservoirs, including those of the skin, resulting in dehydration of the skin. Ingredients: Magnesium Citrate, Flaxseed Powder, Capsule Shell: Hydroxy Propyl Methyl Cellulose, Hyaluronic Acid (soya), Vitamin E (Succinate), Vitamin C (Ascorbic Acid), Zinc Bis-Glycinate Prep as K-Pure (Citric Acid, Maltodextrin, Silicon Dioxide), L-Tyrosine, Iron Prep (Ferrous Bis-Glycinate, Citric acid, Silicon Dioxide). Anti-Caking Agent: Silicon Dioxide, Beta Carotene Prep (Modified Starch, Corn Starch, DL-Alpha Tocopherol), Grapeseed Extract, Niacin (Nicotinamide), Anti-Caking Agent, Magnesium Stearate, Co-Enzyme Q10, Copper, Bis-Glycinate Prep (Maltodextrin, Silicon Dioxide), Vitamin D3 Prep (Acacia Gum, Sugar Cane, Sunflower Oil, Starch, Cholcalciferol), Riboflavin, Biotin. I have never seen a product with 250mg of Hyaluronic Acid plus Flaxseed, Co Q10 and all the rest in one bundle. Hyaluronic acid is amazing. If you never heard of it, search online for info, they call it the fountain of youth. I've only been taking it 3 weeks and my skin and hair look as good as they did 20 years ago! I've noticed my facial skin looking much more healthy, and lines around my eyes have smoothed significantly. My nails are a lot stronger too. I'm now replacing my usual multivitamin with this. Look great and feel great. Another winner for sure. Try it! Works brilliantly! I've been using hyaluronic acid for years, it's the best product for my skin and hair. It was costing me £29.99 for 200mg a day for a month. This is a bit more expensive but I really couldn't believe all the ingredients in it! I'm an avid supplement user and really believe good nutrition keeps you looking young, healthy and feeling great. Highly recommend. this company does great products. Wonderful! I could tell the difference in my skin and hair after just a few days. The only problem is now I'll have to keep taking it every day. I used their fat burner to get in shape before 3 months of travelling around the world. Time to get back to the glamour of London! Would highly recommend. Purchase Hyabeautiful right now online with confidence via our secure store. Yes. Hyaluronic Acid is manufactured in a state of the art GMP (Good Manufacturing Practice) facility. And adheres to all EU regulations. 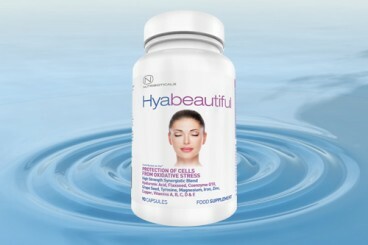 Can I take Hyabeautiful with other vitamins? You do not need to take a multi-vitamin in addition to Hyabeautiful. If combining other specialists vitamins then consult your GP. Can I take Hyabeautiful with medication? It is recommended you check with your doctor (GP) before combining any food supplements with medication. Do I need to drink water with Hyabeautiful? Yes, you should drink around 2 litres of water per day. Hyaluronic Acid helps keep your hydrated, so water is essential, every day. Can I take Hyabeautiful when pregnant? No. Do not take any nutrirional supplements unless directed by your doctor. Can I interrupt taking Hyabeautiful? Yes, it’s a food supplement not a medicine. It is recommended for full effect you take the product daily for many weeks. 2. Nutr. 2010 Apr;103(7):929-38. Health effects with consumption of the flax lignan secoisolariciresinol diglucoside. Adolphe JL1, Whiting SJ, Juurlink BH, Thorpe LU, Alcorn J. 3. Leach RM, Harris ED. Manganese. In: O’Dell BL, Sunde RA, eds. Handbook of nutritionally essential minerals. New York: Marcel Dekker, Inc; 1997:335-355. 4. Muszynska A, Palka J, Gorodkiewicz E. The mechanism of daunorubicin-induced inhibition of prolidase activity in human skin fibroblasts and its implication to impaired collagen biosynthesis. Exp Toxicol Pathol. 2000;52(2):149-155. 6. Wang X, Quinn PJ. Vitamin E and its function in membranes. Prog Lipid Res. 1999 Jul;38(4):309-36. 7. Buettner GR. The pecking order of free radicals and antioxidants: lipid peroxidation, alpha-tocopherol, and ascorbate. Arch Biochem Biophys. 1993 Feb 1;300(2):535-43. 8. Shibata A, Nakagawa K, Kawakami Y, Tsuzuki T, Miyazawa T. Suppression of gamma-tocotrienol on UVB induced inflammation in HaCaT keratinocytes and HR-1 hairless mice via inflammatory mediators multiple signaling. J Agric Food Chem. 2010 Jun 9;58(11):7013-20. 9. Kivirikko KI, Myllyla R. Post-translational processing of procollagens. Ann NY Acad Sci. 1985;460:187-201. 10. Myllyla R, Majamaa K, Gunzler V, Hanauske-Abel HM, Kivirikko KI. Ascorbate is consumed stoichiometrically in the uncoupled reactions catalyzed by prolyl 4-hydroxylase and lysyl hydroxylase. J Biol Chem. 1984 May 10;259(9):5403-5. 11. Traikovich SS. Use of topical ascorbic acid and its effects on photodamaged skin topography. Arch Otolaryngol Head Neck Surg. 1999 Oct;125(10):1091-8. 12. Fitzpatrick RE, Rostan EF. Double-blind, half-face study comparing topical vitamin C and vehicle for rejuvenation of photodamage. Dermatol Surg. 2002 Mar;28(3):231-6. 13. Rhie G, Shin MH, Seo JY, et al. Aging- and photoaging-dependent changes of enzymic and nonenzymic antioxidants in the epidermis and dermis of human skin in vivo. J Invest Dermatol. 2001 Nov;117(5):1212-7. 14. J Med Food. 2003 Winter;6(4):291-9. Polyphenolics in grape seeds-biochemistry and functionality. Shi J1, Yu J, Pohorly JE, Kakuda Y. 17. Z Gerontol Geriatr. 1999 Apr;32(2):83-8. [Modulation of oxidative stresses in human aging skin].mBlatt T1, Mundt C, Mummert C, Maksiuk T, Wolber R, Keyhani R, Schreiner V, Hoppe U, Schachtschabel DO, Stäb F.
19. Oda Y, Uchida Y, Moradian S, Crumrine D, Elias PM, Bikle DD. Vitamin D receptor and coactivators SRC2 and 3 regulate epidermis-specific sphingolipid production and permeability barrier formation. J Invest Dermatol. 2009 Jun;129(6):1367-78.